Even as offices seek to go paperless, most businesses still need reliable and cost-effective printing solutions. Sandia Office Supply carries all major types and brands of printers as well as everything you need to keep them running. Because we are an HP Premier Partner, we also carry a full line of refurbished HP office printers to provide more cost-effective solutions for your business. In addition to inkjet and laser printers, we also carry specialty printers, including photo and label printers. Sandia Office Supply is your one-stop-shop for everything you need to keep your business running smoothly. What good is your office printer without new toner or inkjet cartridges and paper? When it comes to office printer consumables, we’ve got it, and our knowledgeable staff can help you find the products that will save you money! Our mission at Sandia Office Supply is to save you time and money! 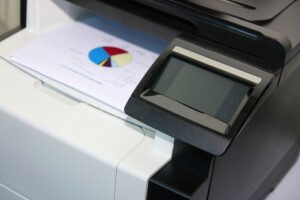 Upgrading to a more efficient and eco-friendly office printer is one way to save—and we have the inkjet and laser printers that will meet your needs. We are proud to be New Mexico’s largest independently-owned office supply store. We have over 30,000 items in our inventory, ready for free next-day delivery in Albuquerque, NM and beyond! For new office printers, printer supplies and more, Sandia Office Supply is ready to keep your business moving forward. Call 505-341-4900 to order your office printers from Sandia Office Supply of Albuquerque, NM today!